Originally named the “Ledo Road”, it was constructed under the direct supervision of American General Joseph Warren Stilwell, and was renamed after him in early 1945 at the suggestion of Generalissimo Chaing Kai-shek. General Stilwell was the Chief of Staff to Allied forces in the China-Burma-India (CBI) theatre for the defence of Burma (Mynamar) from Japanese forces. Stilwell technically served under Generlissimo Chaing Kai-shek, Supreme Commander of Allied Forces in China and such parts of Indo-China (now Vietnam) and Siam (now Thailand) as might become accessible to the troops, and in 1943 fell under Admiral Lord Mountbatten who was appointed Supreme Allied Commander of South-East Asia forces. 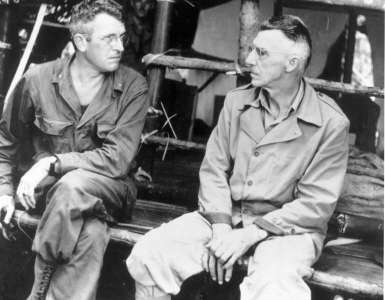 At that time, Stilwell was also appointed Deputy Supreme Allied Commander, South-East Asia forces. 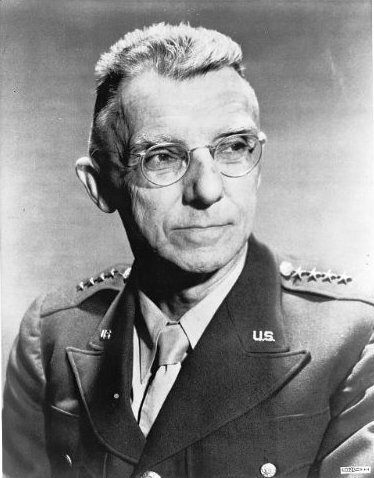 However, General Stilwell, as a result of his multiple positions within complex command structures, was able to often break the chain of command, and communicated directly with the US Joint Chiefs of Staff on operational matters. This project was initially proposed by the British after they prospected the Patkai Range for a road from Assam into northern Burma (Myanmar). It was finally initiated in 1942 after the Japanese had fully captured Burma (Myanmar). With the lines of communication from India to Allied Forces in Burma, and the land route for supplies to the Chinese forces fighting the Japanese in China, both cut, the strategic situation had become critical. The topography of the Indo-Burma border consisted of very difficult terrain, with thick, inaccessible, and Malaria and Dysentery infested forests. The only remaining route for supplies into China was by air, flying a roundabout route over the eastern Himalayas, ”the Hump”, to avoid Japanese fighters based at north Burma. Both the required altitude and the distance impacted fuel usage, severely reducing the quantity of supplies that could be delivered to China, causing the need to restore a land route to become paramount. It was in the spring of 1942, Japanese forces overran Burma, cutting off the last significant land routes that supplied the struggling armies of Generalissimo Chiang Kai-shek in China. The United States and its allies extremely needed to keep China in the war because its forces preoccupied hundreds of thousands of Japanese troops. Holding that valuable Chinese turf permitted the Allies to attack Axis powers in the European theater, at the same time building a necessary launch site for an Allied attack on Japan’s home islands. However, that grand strategy could only work if China and allied troops could be routinely supplied. General Stilwell’s Operations Officer, Lieutenant Colonel Frank D. Merrill, recommended building a road from Ledo, Assam, India to Burma, connecting the old Burma Road to provide a land supply route into Burma for support of the Allied soldiers who were fighting the Japanese forces in North Burma and China. Lieutenant Colonel Frank D. Merrill Commanding officer of “the experienced jungle troops, for a dangerous and hazardous Mission – somewhere” lead his specially trained 5307 Composite Unit (Provisional) called “Merrill’s Marauders” to the Ledo Road and started marching on foot from Margherita, near Ledo, India on February 7, 1944 passing through Pangsau Pass (Hell Pass), Shindbwiyang, Jambu-Bam, and then Myitkyina most of the times fighting and struggling against rains, mud, swamps, Malaria, Dysentery, Typhoid and strategically positioned enemies at different locations on their way. Merrill’s Marauders seized Myitkyina air-strip on May 17, 1944 despite strong resistance from Japanese forces. Then after some days later, they captured Myitkyina town itself, which was stronghold of Japanese forces based in north Burma and the two months campaign ended on August 3, 1944 with Merrill’s Marauders 127 deaths and 291 wounded besides, other casualties. Myitkyina was one of the main missions of Stilwell. In December 1942, the road construction begun by constructing Warehouses, Hospitals, Barracks and base roads at Ledo, Assam, India side by side fighting with the Japanese forces. On December 16, 1942, Allied forces began building the double-track, all-weather Ledo road. Subsequently, the Americans had brought heavy road construction machineries to these wild hills like Bulldozers, Cranes, Power-shovels, Caterpillars, Steam-rollers, in massive procession from the United State production-lines 12,000 miles away, across two Oceans and past three Continents. General Stilwell had organized a ‘Service of Supply’ (SOS) under the command of Major General Raymond A. Wheeler, a high profile US Army Engineer and assigned him to look after the construction of the Ledo road. Major General Wheeler in turn, assigned responsibility of base commander for the road construction to Colonel John C. Arrowsmith. Later, he was replaced by Colonel Lewis A. Pick, an expert US Army engineer, as road construction was slowed down under Arrowsmith during the monsoon season of 1943. He had employed some of the finest mechanical roadmakers from Americans, British, Indian, Chinese and West Africans to fight against the wild jungles, tangles of swamp and forest, deep valleys and high cliffs and test of heavy rains and floods across the Indo-Burma mountain Range. On December 27, 1943, three days ahead of schedule, the road reached Shindbwiyang Finished grading and graveling remained to be done, but the 117 miles from Ledo to Shindbwiyang were open before January 1, 1944, as General Stilwell wished. Colonel Pick’s celebration for the engineers omitted none of the available essentials. As he congratulated them for opening 54 miles of trace in 57 days, a convoy came rolling into Shindbwiyang with candy, doughnuts, and 9,600 cans of beer. 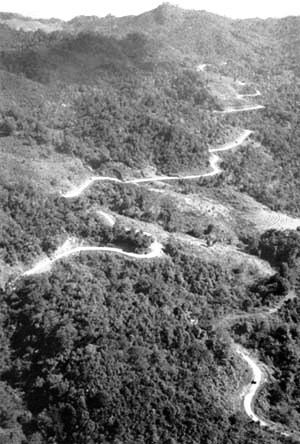 In late 1944, barely two years after Stilwell accepted responsibility for building the Ledo Road (Stilwell Road), it connect to the Burma Road though some sections of the road beyond Myitkyina at Hukawng Valley were under repairing due to heavy monsoon water, and it become a highway stretching from Assam, India to Kunming, China 1,079 miles length. On January 12, 1945, the first convoy of 113 vehicles was led by General Pick from Ledo and was reached Kunming, China on February 4, 1945 and celebrated the achievement. The road construction was estimated to cost 137,000,000 dollars. gasoline pumped from Calcutta to a station near their starting point. In the course of time, the Stilwell Road had virtually disappeared due to the road lies in the lands of three different nations that are China, Burma and India and due to non maintenance by the respective nations. However, 61 km of the road lies in India, 1,033 km in Burma (Myanmar) and 632 km in China. In India out of 61 km, 30 km lies in Assam and 31 km in Arunachal Pradesh. The border between Assam and Arunachal Pradesh has 14 km of the road section previously which was in deplorable condition, now it is repaired and the construction of international trade route is underway to link Myanmar at Pangsau Pass. In India side, the road is being repaired and renovated up to Nampong under this scheme and extension of the renovation work up to Pangsau Pass, Indo-Myanmar border is underway. The section of road which lies within Arunachal Pradesh has been maintained by the Government of Arunachal Pradesh and the road section which lies within the area of Assam out of 14 km has been in maintained by the Government of Assam respectively. Indian government has proposed this road for reopening as International Highway for trade route to link Myanmar (Burma), China and other Southeast Asian countries in its Act East Policy. The reopening of this road as trade route will increase the interaction between the people of neighboring countries and maintain good relationship among the member countries. It will also boost trades and attracts inland and foreign tourists as the road itself is historically famous and significant due to Second World War, which in turn will boost Socio-economic development of this most backward border area and will benefited to the local people. The northeast India is geographically isolated and the economical development is lacking behind other parts of India due to several factors even though the region is endowed with natural resources. There is already approved trade routes with Myanmar from Nagaland and Manipur and to Bangladesh from Assam and Tripura which is one of the significant means of foreign trade and regional co-operation towards economic development of the region. Everyone in this area is looking forward for implementation of the Act East Policy project within the stipulated time and hoping the area be established as a major international trade center. * Lies on the Burma Road.